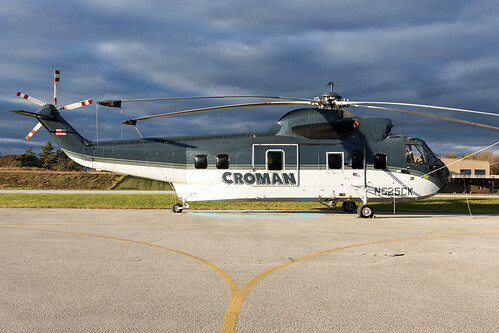 Ex-PIA Sikorsky S-61N Helicopter (AP-AOB) Still Active! 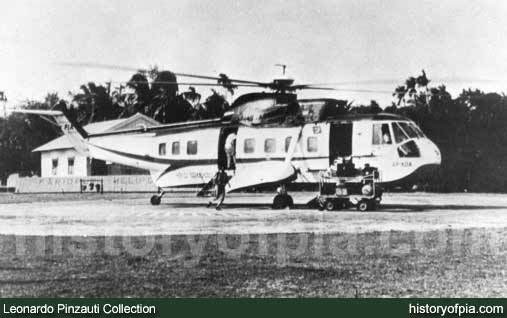 AP-AOB was one of three brand new Sikorsky S-61N helicopters that were delivered to Pakistan International Airlines (PIA) between 1962 and 1964 for operating airline's innovative & revolutionary scheduled helicopter flights in East Pakistan. After loosing two S-61Ns (AP-AOA & AP-AOC) in accidents in East Pakistan, the lone surviving 1963-built AP-AOB was sold in April 1968 to UK-based BEA Helicopters. The photo on following link shows more than 45 years old ex-AP-AOB of PIA in Melbourne, Australia, as fire fighting helicopter sporting US registration N7011M in Carson Helicopters livery. Following photo shows AP-AOB's sistership AP-AOA at Faridpur Heliport in East Pakistan. Re: Ex-PIA Sikorsky S-61N Helicopter (AP-AOB) Still Active! An excellent find!! !Thanks for sharing!!!! Thats a cool bit of information Abbas. Appreciated. Well this kind of service should be revived for low traffic areas. The lavatory for Sikorsky S-61N helicopters that served PIA were designed and installed by PIA's own Aircraft Engineers/Technicians in Pakistan. The pilots of PIA ambhibious Sikorsky S-61N helicopters were also trained to perform landing on water. Backside of PIA helicopter service leaflet from 1963. 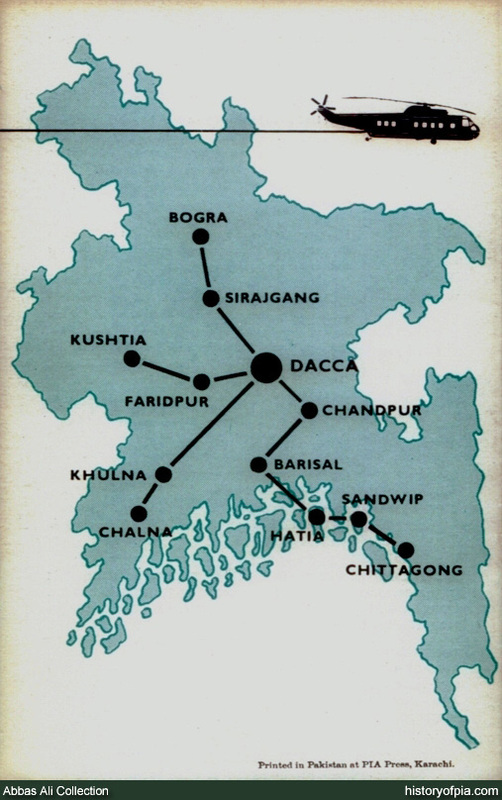 It shows map of East Pakistan and routes flown by Dacca-based Sikorsky S-61N helicopters of PIA. And here's brochure about PIA helicopter service that was operated in 1990s for short period of time. 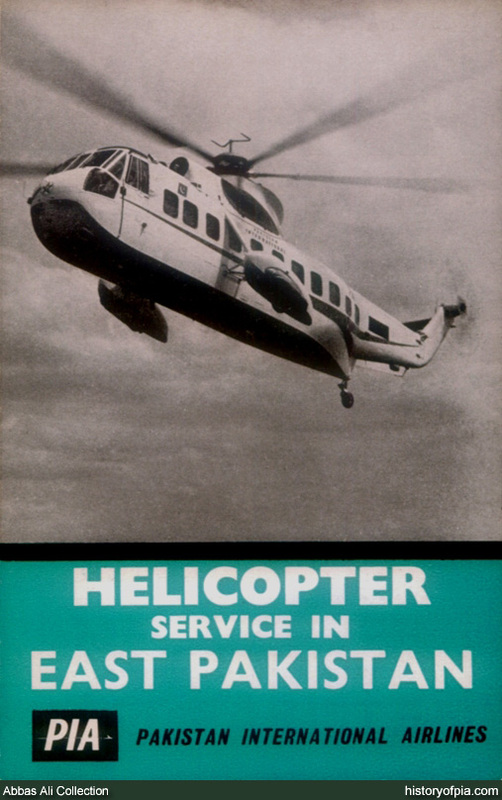 PIA Mi-17 helicopter service brochure from 1995. Flights were operated to Abbottabad, Bhurban, Sialkot and Peshawar. Charter service was available for Shogran, Kalam, Naran and Chitral. Landing Practice in Arabian Sea. Saeed Nafees wrote: Some more Ex-PIA S-61N. Really nice photos,Thanks for sharing them. I've noticed in all except photo#2 the helicopter has American registration,but PIA livery does any boy know why?? ?Are these pre delivery photos?if it is then It means the photo showing landing practice is taken somewhere in America? we need them back,(replaced) may help PIA . The photos showing chopper with US registration for pre-delivery test flights must have been taken before delivery acceptance by PIA. US registration must have been removed after completion of test flights and delivery acceptance. I guess these choppers arrived in Pakistan on some cargo ship and it's quite possible that PIA accepted their delivery in Pakistan after completion of test flights. Wow, great photos. Those helicopters were symbol of Jinnah's ( United ) Pakistan. Carsons helicopters' one address is in PA which is nearby, probably go there and take some pictures with that 767 if available. ex AP-AOB currently with Croman Corp. Hats off to everyone involved in keeping this bird flying and fit, i think this must have been overhauled so many times. Abbas, do you think this has gone cockpit change too with respect to modern flying techniques? Or still old same cockpit as it used to be since 1960s?